SCVHistory.com LW2646 | William S. Hart | Hart with Actress Lina Basquette, 1932. March 7, 1932 — Actors William S. Hart and Lina Basquette. 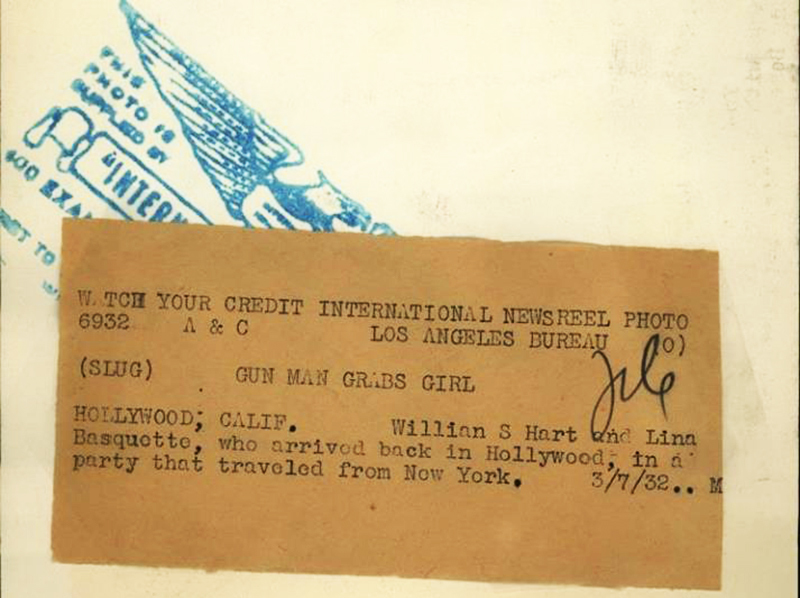 International Newsreel wire photo, 5x8 inches. The original print is distorted by the impression of a small picture frame that must have been squished into it for a long time. Date-stamped on the back, March 11, 1932. The only other writing is the actors' names, in pencil. 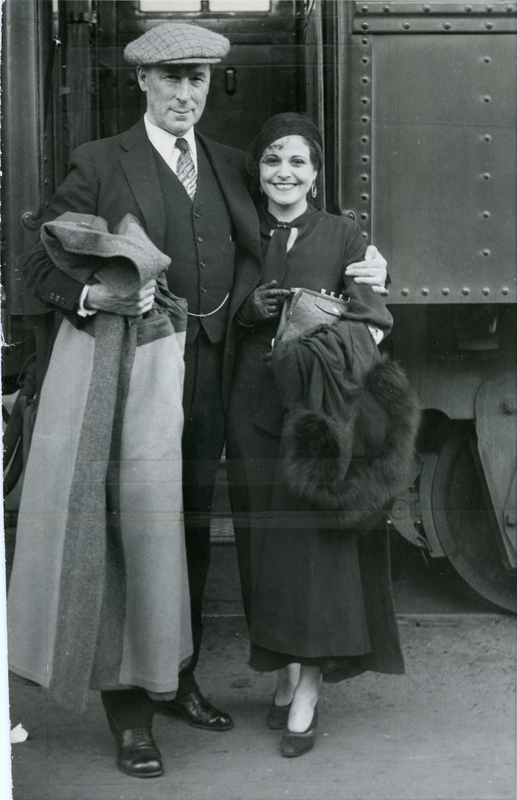 William S. Hart and Lina Basquette, who arrived back in Hollywood, in a party that traveled from New York. 3/7/32. Recognize the gentleman above? If your memory does not respond he is Wiliam S. Hart, whose death-defying exploits and trick work with a six shooter used to thrill us some years ago on the silver screen. Lina Basquette, another film notable, is keeping Bill company. They are shown on arrival in Hollywood after journey from New York. Old Bill probably wouldn't like being considered a faded memory at this time, even if he was. He'd made his last film ("Tumbleweeds") in 1925 and wanted to return to the screen, but Hollywood wouldn't have him. It had moved on from his brand of melodramas; it wanted "blood and thunder" scripts that featured the likes of Hoot Gibson and Buck Jones. Basquette, whose career spanned from 1917 to 1943 (plus a twilight role in 1991) appeared on screen with Gibson and Jones, but never (to our knowledge) with Hart. Born Lena Copeland Baskette on April 19, 1907, in San Mateo, she was discovered and signed by Carl Laemmle, who saw her perform as a child dancer in San Francisco. Her stage mother moved young Lena's (Lina's) career along. The Ziegfeld Follies Frenchified the spelling of her name. By the time of this 1932 photo, she was onto her fourth marriage. Her first was at age 18 to Sam Warner of Warner Bros., who was 38. He died two years later, leaving her with a baby daughter (Lita), whose custody she lost for good to Warner's relatives. After two other brief marriages and an affair with boxer Jack Dempsey, which ended badly in a botched suicide attempt (on her part), she married Dempsey's personal trainer, Theodore Hayes, on Oct. 19. 1931. Trouble was, he was already married. Basquette was still (illegally) married to Hayes when she was photographed here with Hart. Her marriage was annulled six months later, on Sept. 10, 1932. Basquette's fourth husband would also be her fifth; she remarried Hayes legally in 1933. That lasted a couple of years and produced a son. She would marry three more times for a total of eight. By the numbers, five marriages ended in divorce, two in death and one in annulment. Basquette left the film business in the 1940s to run a dog kennel in Pennsylvania before retiring to Wheeling, W.V., where she died Sept. 30, 1994. Hart married only once, and it lasted about 5 minutes. Read on. LW2646: 9600 dpi jpeg from original photograph purchased 2014 by Leon Worden.